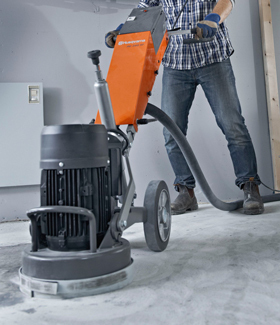 A floor grinder for surface preparation and grinding of adhesive residue, paint and spackle on medium-sized concrete areas. The grinding and suction is efficient thanks to the high rpm levels, the wide range of grinding discs and the design of the dust guard and vacuumport. PG 280 SF is easy and convenient to use, with ergonomically designed handlebar and low noise levels. Two engine options: 3 kW 3-phase or 2.2 kW 1-phase. 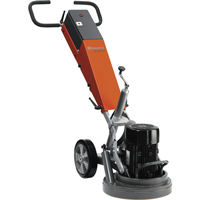 The ideal grinder for rental customers who need to grind concrete, mastics, paints, etc. It’s small and easy to maneuver, yet strong enough to get the job done. Perfect for grinding adhesive residue, paint and spackle on medium-sized concrete areas. Efficiently grinds due to high rpm levels and a wide range of discs available for various applications. The dust guard and vacuum port are designed to create efficient suction of dust and therefore create an almost dustless environment. Easy and convenient to use, with ergonomically designed handlebar and low noise levels. Large range of diamond tooling available for a wide range of grinding applications.